It’s the final day of Back to School week and it’s been so much fun, I’m sad to see it come to an end! If you’ve missed any of the weeks posts you can find them all here! 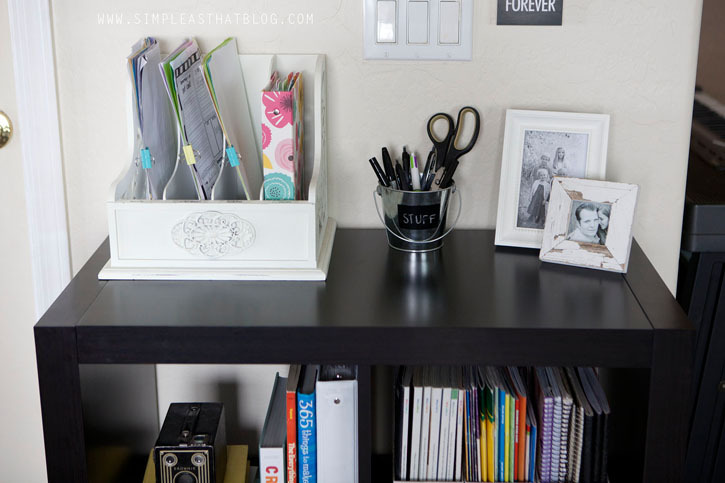 Today I’m sharing the details of our new homework station/family command center. It’s small and it didn’t cost a lot, but this little area in our home has been a lifesaver with school starting. 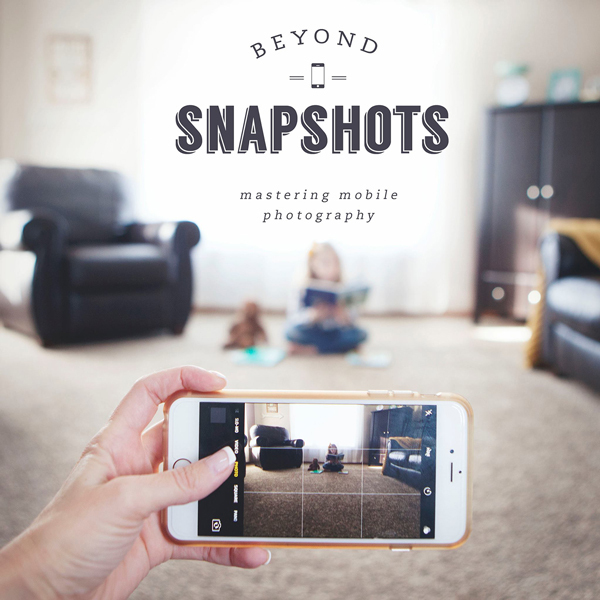 Keep reading to find out the materials I used and what we keep in this area of our home that helps our family stay organized and takes some of the stress out of the afterschool rush. We recently moved from Alberta, Canada to sunny Arizona and as with any move, its taken us a little while to get settled in our new home. We’ve been unpacked for a some time now, but I didn’t quite feel like I had things organized the way I liked. We’re in this rental temporarily and with a husband in med school I didn’t have a lot to spend, but I knew we were in need of a space that would work as a family command centre and a spot to keep school papers and homework supplies. It’s pretty basic and bite-size, but I was able to get a lot of use out of a small space without spending a lot. Since we don’t have a built in desk area in this house, I’ve been looking for inexpensive furniture options for a command center since we got here in June and I finally settled on one of these four cube Ikea expedit shelves. It fit perfectly in the space I had and the price was right. With this as the foundation for our command center/homework station it started to come together quickly. 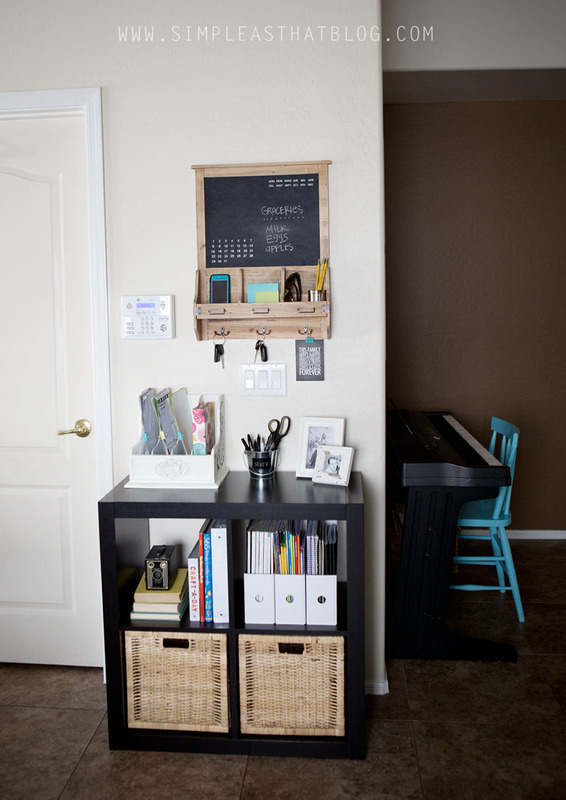 The next thing I added to the space was this wall organizer/chalkboard. My sister in law had one and I looked around for something similar, but just kept coming back to this one. It’s a great place to keep keys so we aren’t searching for them as we’re headed out the door, I can quickly jot down any grocery items I need on the chalkboard, keep ingoing/out going mail and any other items that we need access to daily. It’s pretty lightweight, but it serves its purpose and was the best price I found on something like this. One of the big things I wanted to address in this space was all the paper that comes home with the kids from school. It can get out of control so quickly and I knew we needed a place where we could file it all as the kids brought it home. I already had this four section mail holder so I labelled it with 3 school-age kids names and left one section for myself. It makes such a difference having a designated spot where everyone knows to put their papers and where to find them. 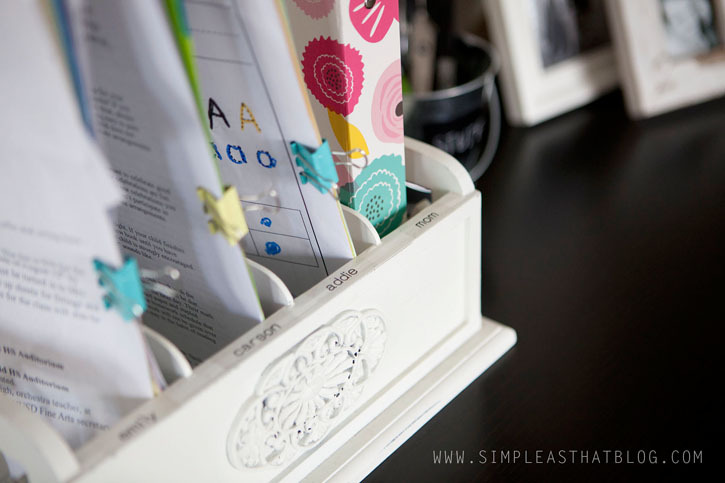 There are a lot of inexpensive desktop filing products that you could use for managing school papers – I really like the fact that this one is upright so I can see the papers easily. No more misplacing this permission slip or that teacher newsletter. As soon as the kids come home from school one of the first things we do is go through their papers, file what we need to keep, throw out what we don’t and if there are any special art projects we have a spot for those too. 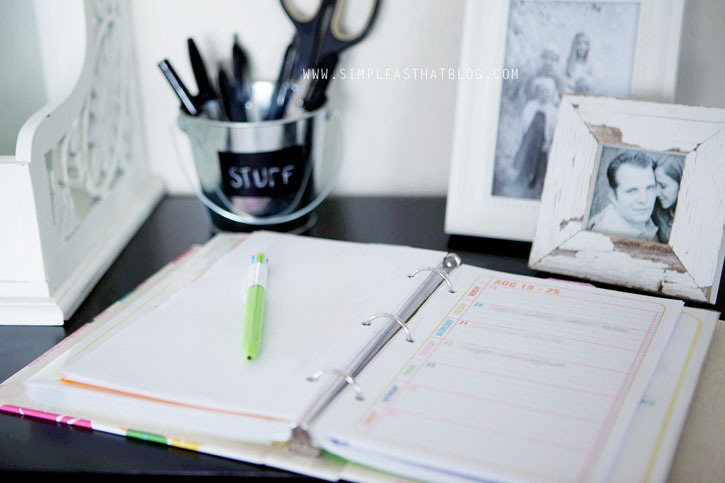 Because my planner contains everything I need to stay organized throughout the day – my calendar, meal plan, to-do lists and more – I like to keep it in a place where I can refer to it often. Our command centre is located right by the kitchen so its the perfect spot. I shared some info about my 2013 Life Planner from Crystal Wilkerson the other day PLUS some fun printable chore charts and daily checklists, you can check out the post here! Crystal is offering 50% off everything in her digital shop now through August 31st and this also includes her planner!! This little area not only serves as our family command center but as a handy homework station as well. It’s close to our kitchen table where the kids typically do their homework, so I keep it stocked with things like pencils, erasers, scissors, pens for me to sign their agendas, extra workbooks + coloring books for the youngest. Everything we need for homework is right here, easy to grab when we need it. This has really helped the kids stay focused on getting their work done afterschool. I used these inexpensive magazine files to keep extra workbooks, some of my favorite magazines and a variety of blank notebooks that the kids like to draw in when I’m preparing dinner. I also keep some of our favorite kids craft books + my recipe binder on this shelf. Inside the baskets you’ll find clipboards which come in handy when the kids sit at the couch to do homework, crayons + markers and a few other miscellaneous crafty things. There you have it, our family command center/homework station in a nutshell. 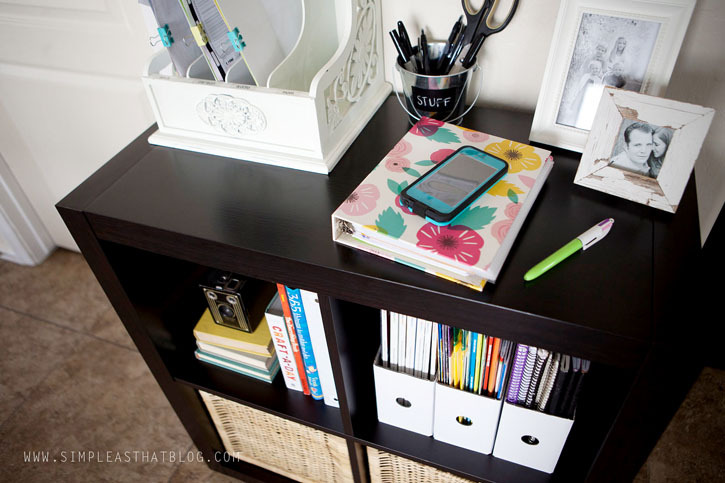 It’s one of my favorite little spots in our house and it’s made such a difference with keeping things simple, organized and stress-free this school year! Don’t miss all the fun we’ve been having for the past seven days during Back to School week here at Simple as that! 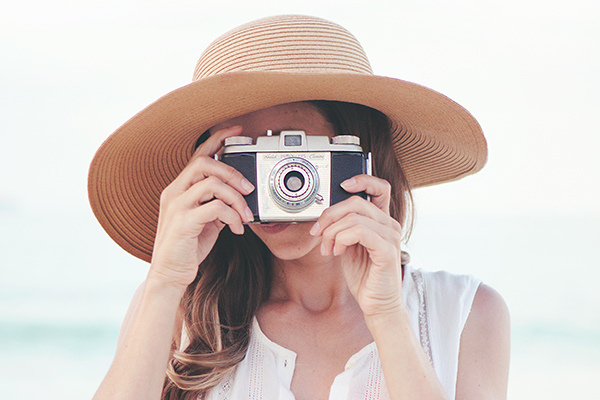 You’ll find all the posts below + some exciting giveaways! I love this idea! I’m going to see if I can do something like it in our house! Dang – I clicked through JUST to see where you got that white 4 section paper holder from! i love this! would love to have some available space to do this! i knew that your family was relocating but for some reason i didn’t realize that you were moving to here arizona! hope you are enjoying our sunny state…it will be much better when it finally cools off at the end of october! 🙂 Welcome to az!!! That is very lovely! I would love something like that in our house – we can get so cluttered! But I never have enough money to do it! I adore the name Carson by the way! so nice! what a great idea. Love the command center. Need one for the house and this is the perfect size! Love the family print. Can you share the source? Thank you! LOVE the family print. Can you share the source? Thanks! such a great space Rebecca!! our new house does not have a good spot for a command center ;( I love yours!! Where did you get that 4 section paper/file/magazine holder? I love that look and can’t fine one online. Check Wayfair. I saw one online today. Inspired by your post, I looked around my home for things to help me set up a command center. Thank you for sharing. Oh please oh please tell me where you got your 4 section mail holder! I ADORE it!!!!!!!!!!! Oh please oh please tell me where you got the 4 section mail holder? I ADORE IT!!!!!! As others have stated, cannot find ANYTHING like that anywhere! Jamy, I picked mine up at TJ Maxx years ago and it still has the label on it. I just had a quick look and the company that made it is called designSTYLES. Sorry I’m not much help. If I ever find anything like it I’ll be sure to update the post with a link. Love this… Featuring it on my blog! 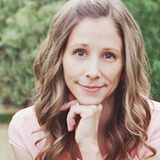 Thanks for sharing on Linky Party! Sharing on my fb page today!!! 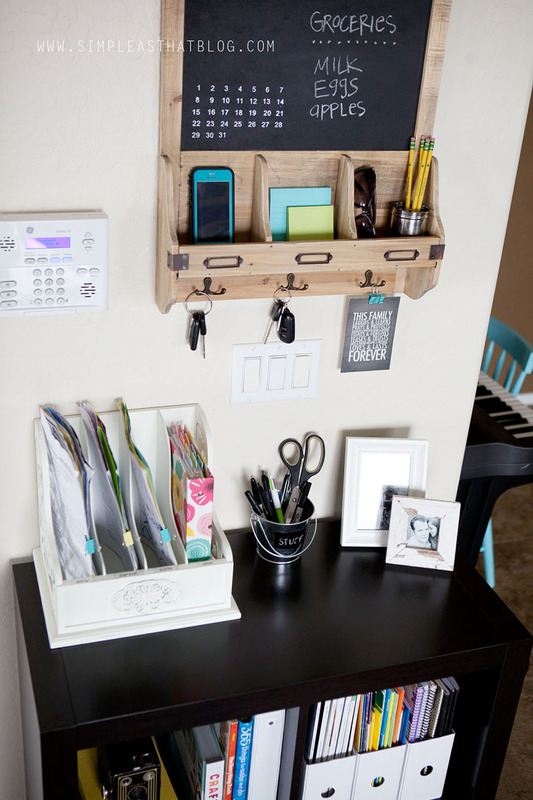 Can you please tell me where you purchased the organizer hanging on your wall? I have looked endlessly for something similar…thank you so much! Fantastic! I would love it if you joined and contribute your awesome posts at my link party at City of Creative Dreams, starts on Fridays 😀 Hope to see you there at City of Creative Dreams Link Party. I went to your store to fin the family print but it’s not there. 🙁 any chance you can put it in again? Or say what the small text says? It’s such a great message! Hi Courtney — I may make it available for purchase again sometime soon. I am interested in your family print, too! 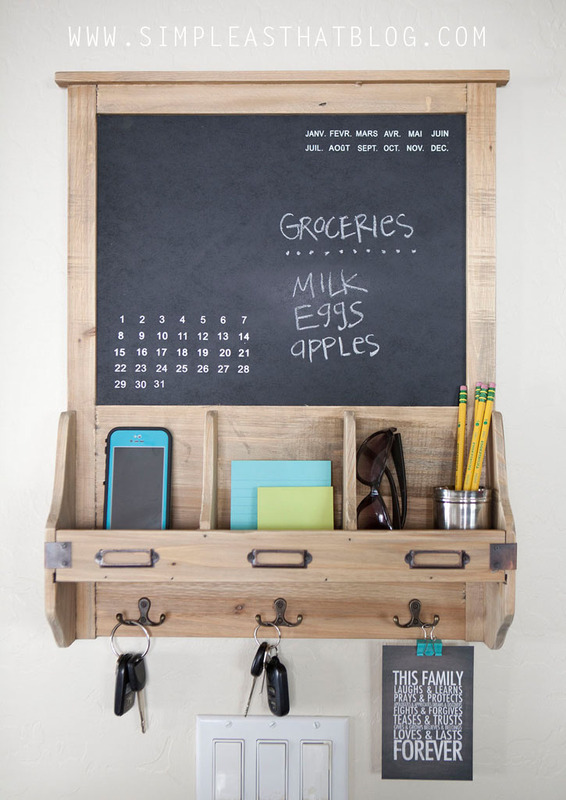 Where did you purchase the organizer/chalkboard? Thank you for showing me a command centre that is not completely out of my budget. You are very inspiring! 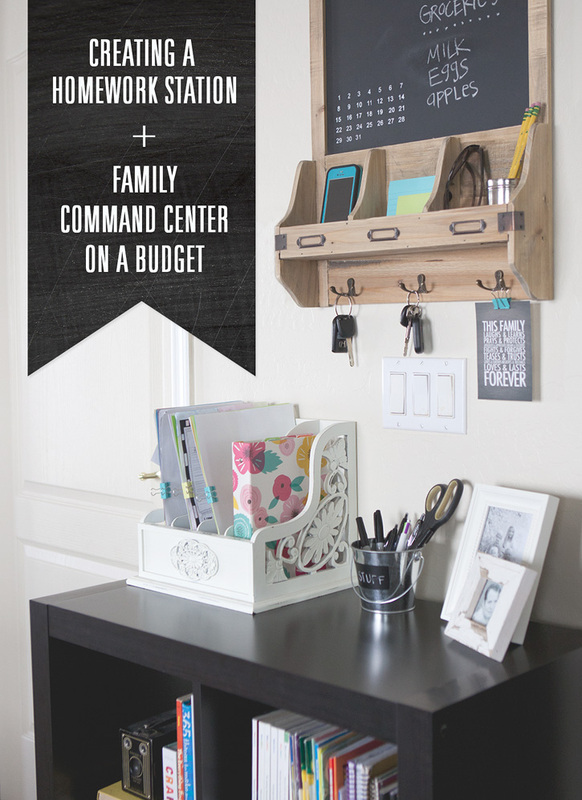 Hi I always thought these “command centers” were over the top, but my oldest just started Kindergarten and I’m finding that as a family we need to be all on the same page more. 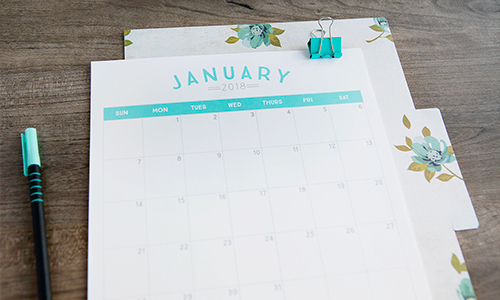 Would you consider adding a calendar here for your family to see what’s going on or do you have another way of helping everyone know what is next? Also, the only place I can see putting this is in my entryway. Is that where yours is located?? Thanks for the budget friendly post. 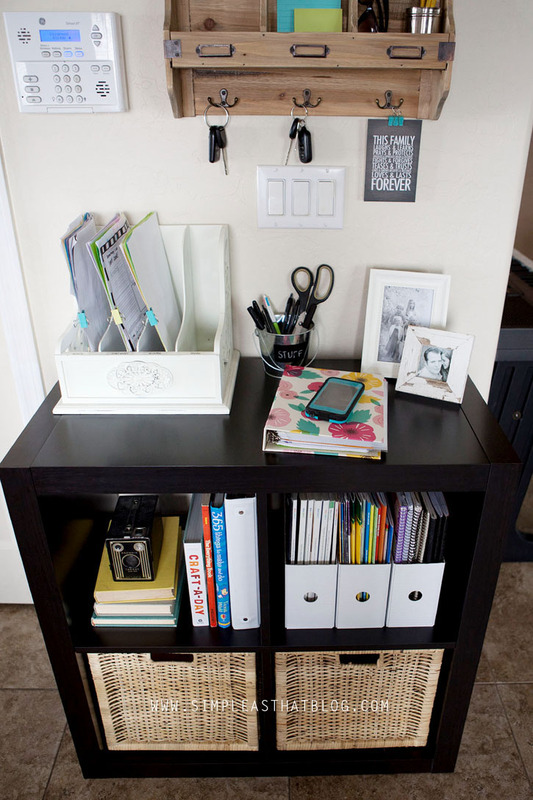 Our command center is located just off the entryway in a high traffic area where papers can easily get put away. I keep a calendar for the family on the fridge to save space here. Can you please tell me more about your planner love the inserts that are showing in the shot where the planner is open! !